Like many of you out there, I was first introduced to flashlights and the outdoors with my dad many years ago. I’ve always loved the outdoors and the adventures that come along with camping, hiking, and overall exploring. My dad always had at least a pocket flashlight or 2 handy to help around camp and cook meals with. I can remember when I was very young, on my back under a car helping my dad. It was usually on a cold winter night after he got off work that we had to do the repairs on the family car. There I was 6 years old holding the flashlight while he busted his knuckles against the cold steel of the chassis. I remember that my first flashlight was a yellow plastic 2 D-cell flashlight that I got as a gift. As I got older and went on camping trip after camping trip, working on my own car or out deer hunting, I can say I handled plenty of flashlights! But as the years went on, I’m proud to say that the flashlights I have in my camping gear were even stronger than the ones I handled as a boy. I still wanted to find which flashlight was considered the best at various tasks. 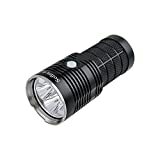 I found myself looking for a good flashlight online, and what I found was A LOT of information and TONS of options! In fact, it was so much information, that I felt a bit overwhelmed. I wanted something where I could compare prices, ratings, flashlight sizes, housing quality, and more in an easy to read and use format. Now, while there are alot of lists or Youtube videos from people sharing what their opinions of what the best flashlight on the market is; I saw these as just that…opinions. I appreciate opinions, but I also like looking at the cold hard fact and comparing directly. Dissatisfied with the lack of comparison guides for best flashlights out there, I decided to create my own. After spending many hours of research and analysis, I’ve put together what I call the Ultimate Best Flashlight Guide! 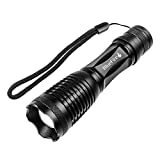 Its a complete interactive chart that allows you to view the information you want to see on nearly 50 of the top best flashlights on the market. So, I’m not a flashlight junkie…yet! (I don’t think there is anyone out there that has tried every flashlight on the market. And if they have, they are likely out killing their dinner rather than blogging about it). But I feel like I have provided a valuable resource based on the available information that is out running wild on the internet. 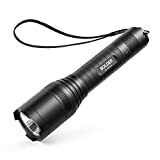 My goal with the site here is to give you the information you need in an easy to digest format so that you can make the best possible flashlight buying decision based on what matters to YOU. Yes, I’ll be providing my own opinions and input along the way, but when it comes right down to it, you might be more concerned with price than the thickness of the blade. As I do more research, I’ll be providing in-depth reviews of flashlights, videos of my own tests with different flashlights, and more comparative analysis. In short, I hope my site here with help you find the best flashlights for you. I love all sorts of flashlights. You can say that I have an addiction to collecting flashlights. It all started years ago when I got my first real flashlight, the 2D Maglite. I felt empowered every time I got to use that beast, until I realized that it was not the best torch for every situation I was faced with. That’s when it snowballed out of control, I started buying random flashlights just because I did not own it yet. I quickly realized that there is more to price and size of the flashlight.